The bulldog had to be one of the most misleading names in the history of automobiles. As you stepped through its huge gullwing door and settled into its deeply contoured cloth-covered seat, you thought of a hang glider, perhaps, or a cheetah. You certainly didnt think of a pedigreed hound. But bulldog it was called, after the personal airplane of aston martins managing director alan curtis. top speed of 201 mph engine typedrivetrain: Twin- turbocharged,	double-overhead-cam v8 . Displacement	5.34 l power rating	600 hp transmission	5-speed manual chassis: Front	double a-armrear de dion axle and	coil springs suspension; 3,740 lbs. Mans best friend curtiss commitment to turning out quality sports cars had been called into question, so the 1980 bulldog was his bark back to the critics. It was a custom-designed prototype, a one-off, model that was never intended to go into regular production. Curtis chose a twin-turbocharged, 5.34-liter v8, and the usual four weber carburetors in a standard aston were replaced by a bosch fuel-injection system, all of which supplied the power to put the bulldogs top speed over the 200mph mark. if dogs could fly aston martin gave the car a jaunty greenhouse shape defined by a steeply raked windshield almost in line with the nose, and a louvered rear window nearly symmetrical with the windshield. Hydraulic door lifts lurked under the hatch along the flank of this angular, singular beast. 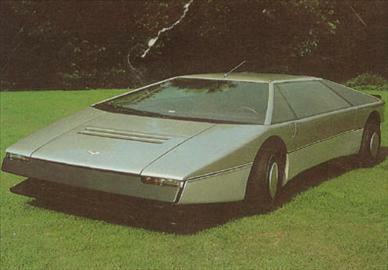 Presented in 1980, the aston martin bulldog looked like it belonged in the year 2080.